0-60 in 15 sec. Top speed of 90 mph engine typedrivetrain: Overhead-valve v8 displacement 239 cu. In. Power rating 115 hp transmission 3-speed manual; Optional 2-speed powerglide chassis: Front upper and lower a-arms, coil springsrear live axle, semielliptic leaf springs; Drum brakes; 3,267 lbs. More than one way... this slight design alteration was called reskinning, and in the boom of postwar america, it was an effective tactic. The cars were fundamentally of good quality, and consumer interest was strong. The japanese hadnt yet made inroads in the american market, and sports cars like the mg and jaguar, although popular, werent yet competitive. 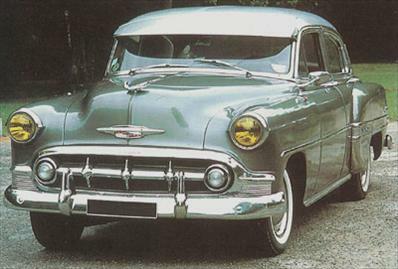 Chevy chrome was king, and the 1953 bel air, with its new one-piece windshield and oval grille, ruled the road. simple quality a reasonably simple in-line six boomed along comfortably under the weight of the bel airs hood. It had a displacement of 239 cubic inches, putting out either 105 or 115 horses, depending on the transmission (with or without powerglide). New options in 1954 included power brakes and power seat (costing $38 and $86, respectively). The four-door sedan was the most popular of the six bel air models in 1954, with 248,750 built that year.